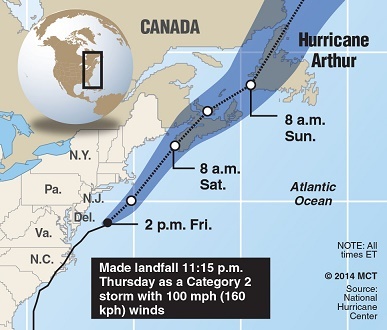 Newsday reported that US Coast Guard from Montauk rescued the two Canadians on board the 39-foot Glim after they became trapped from storm surge from Hurricane Arthur on Friday, July 4. Petty officer Ismael Velasquez from the Montauk Marine Base told Newsday they had sailed to Bermuda for the race and were trying to return to Connecticut. According to the report the boat, which was unnamed, was travelling at two knots when they put out a distress signal at 11:30am in an effort to being swept into Hurricane Arthur. The Coast Guard reached them around 1:30pm. The boat was stationed overnight at the Montauk Marine Base after being rescued approximately 35 miles off of the base. The Glim is homeported in Norwalk, Connecticut according to the East Hampton Star.